Your comfort is always our priority. The QVC Dental Baldivis team wants to make your visits as stress-free as possible, giving you a positive experience every time you see us. Even if you’ve felt anxious about visiting the dentist before, we’ll take extra care so that you feel relaxed and at ease. Our warm and friendly staff wants you to look forward to your appointments. Kindness and compassion are two traits that each of our team members has, along with years in the industry to ensure you receive the best care. If other practices have seemed cold or clinical, rest assured that we’re anything but. You’ll feel as if you’ve stepped into a tranquil spa. In our relaxation room, you can unwind on a daybed, breathe in calming aromatherapy, enjoy soft music and dim lighting and flip through a current magazine while you have a cup of tea or coffee. Penthrox® – An inhaler is self-administered under our supervision, relieving discomfort and helping you feel better. 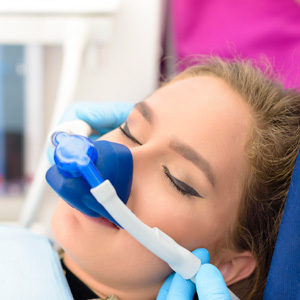 Nitrous oxide – A mask is worn with the gas breathed in easily, allowing anxieties to melt away. Oral sedation – A medication can be taken before your appointment with time allowed for it to take effect. Though you may be avoiding the dentist for many different reasons, there are plenty more to change these habits. Your oral health has an impact on your overall wellbeing. Bacteria present in the mouth can cause an infection that can spread to anywhere in the body. Gum disease has been linked to various issues such as cardiovascular problems. By taking care of your oral health now, you’re protecting yourself in the future. You may find this information regarding a dental study useful. It’s suggested that happy gas can really help to benefit kids as they have a larger pulp, with increased nerve supply and more sensitivity. Contact us today to schedule your appointment or discuss sedation and options for anxious patients in Baldivis! We’re in-network providers with several plans and accept all health funds.